This waistband is the best solution to protect the ostomy bag at the beach or in the pool. 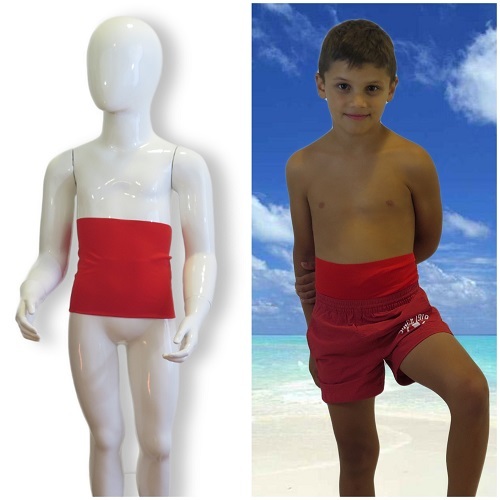 This waistband is the best solution to protect and keep discreet your child ’s ostomy bag when at the beach or in the pool. This special model provides an internal pocket that completely encloses the bag keeping it protected and hidden. The latter is inserted through a special laser cut opening. The inside pocket that holds the bag has a flap, both in the upper part and in the lower one, to obtain maximum discretion. It is indicated for all types of ostomy (colostomy, ileostomy, urostomy) positioned both on the right and on the left.